Is It Worth Doing a Wet Test Before Buying a Hot Tub? Posted on November 16, 2017 April 24, 2019 , in Hot Tubs. Before you buy a hot tub it is essential that you choose a model that is comfortable and will properly suit your needs. While considering the various features and specifications is important as well, taking a wet test is a must before you make your purchase. A wet test is similar to taking a test drive when shopping for a vehicle and while you do not need to do a wet test on each model that you look at, you should for the final hot tubs you are considering to help you make the right choice. What is a Wet Test? Performing a wet test is exactly what it sounds like – you will be sitting in the hot tub when it is filled with water so that you can experience what the hot tub feels like. With a wet test, your hot tub dealer will fill the tub with water and heat to the recommended temperature so that you can soak in it for approximately 15 – 30 minutes. While in the hot tub, you should be getting a feel for the water jets, trying out the different massage programs and testing out the seats. If possible, try to do the wet test on each model that you are considering on the same day. This will keep each model fresh in your mind so that you can make an accurate comparison and judge the differences and comfort levels accordingly. Below, we will list what important areas you should check while performing a wet test. 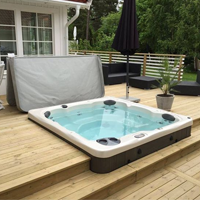 It is important to have a hot tub that has seats which will accommodate children and adults and some users may also prefer ergonomic, multi-level seating options. Take adequate time to test each seat to feel its comfort level and proximity to the massage jets. Also test the lounge set to ensure that you do not float off of it and that it feels comfortable, not tipsy. When testing the seats, make note of the water depth when you are sitting upright. Especially on cooler evenings and seasons, you will want the water level to reach your shoulders to keep you warm while bathing. Undoubtedly one of the most popular features of a hot tub, massage jets have a lot to do with how much you will enjoy your overall bathing experience. While in the hot tub, test the different massage programs and hydrotherapy options that target sore muscles like your legs, calves, upper and lower back. Feel if the jet pressure and placement are comfortable for you and don’t forget to check to see if there are water jets located in the footwell to massage and soothe tired feet. While performing your wet test, take a moment to visualize how many guests could comfortably be seated in the hot tub and if there would be ample space. Look at where the seats are located and the amount of space between them. Also, consider how many people will be using your hot tub on a regular basis and consider if there is enough room for everyone to not feel cramped or have to take turns. No one wants a noisy hot tub! Quality hot tubs, like Hydropool, have minimal to zero noise when operating, allowing bathers to relax and enjoy. The only way to be sure of this is by doing a wet test, where you can check to see if the hot tub is silent while the water is heating, filtering and circulating. In the end, purchasing a hot tub is a large investment and something that you will want to enjoy for many years to come. By doing your research upfront and performing a wet test on a model that you are considering, will ensure that you choose the right hot tub for your lifestyle and needs. Feel free to download a hot tub buyer’s guide to learn more about hot tubs and their benefits.